What is a Vintage Carpet? ‘Vintage’ is the modern synonym for ‘semi-antique’, a term which seems to have gone out of fashion. Vintage carpets are those which have been previously owned, maintained with value and care for and are not presently in production. We can say, antique carpets are those at least a century old and modern carpets are those from the last two decades or so, vintage carpets are anything in between. What are Contemporary Vintage Carpets? The word ‘Contemporary’ literally means ‘modern’ or ‘now’. So, how does a vintage rug become contemporary? The answer is, when a vintage rug with careful maintenance surpasses the demand of time with its outstanding design and elegant beauty, it qualifies as a Contemporary Vintage Rug. Our collection of vintage carpets ranges between the 1920’s through the 1980’s. But, not every merely old rug qualifies as vintage. For any artifact to be qualified as vintage, it must have both the age and the value. A mere glimpse at our carefully selected carpets can explain “Why every old carpet does not qualify as vintage”. Here I will discuss about some of those vintage rugs which have conquered the border of time and still be termed as ‘masterpiece’ when compared with old and modern rugs alike. Finely woven central Persian Isfahan Rug from the 1920’s has a traditionally complex design, but the simplified old ivory and browns palette makes the vintage look so desirable still in today’s market. The pattern has been retained, but the impact is a bit less now. A newish carpet in traditional style simply cannot achieve this. This is one way vintage carpets attract people’s attention throughout time. Often, vintage rugs retain the boldness of pattern in general without excess business. 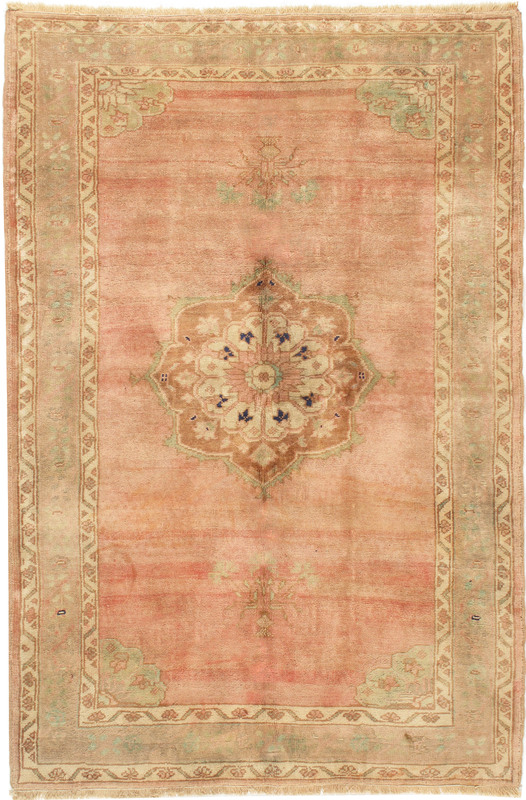 The Turkish Kars carpet U-2724 with ivory border and its huge palmettes has certainly retained the boldness of pattern, but everything inside is slightly more subdued, without being invisible. How could the cranberry field be invisible? The abrash plays up the age, but the somewhat simplified medallion pattern is fairly modern and naturally furniture sympathetic. What we have here is a ‘real vintage rug’ whose effect is totally au courant on any decoration. This carpet is in no way a bland, borderless, broadloom creation. Vintage rugs can add color in a variety of range. 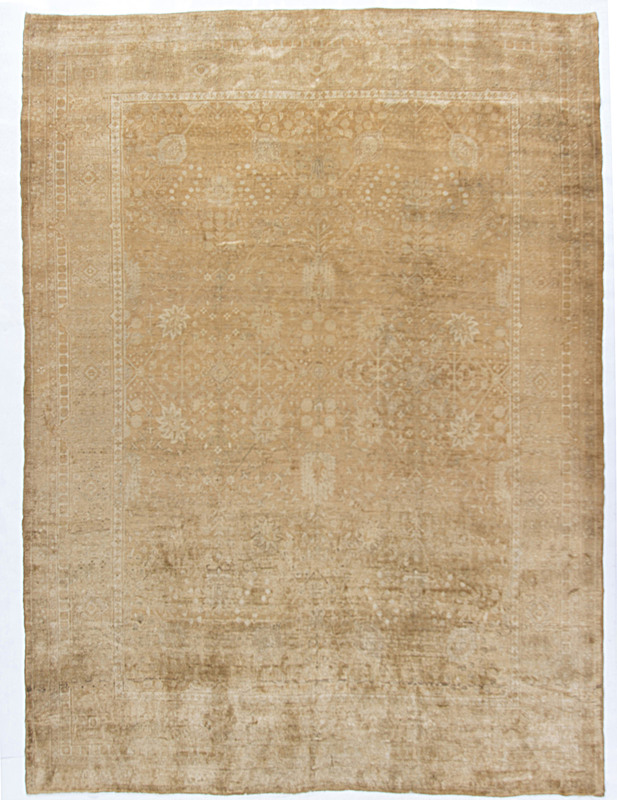 The U-3010 Oushak scatter carpet has a soft rose field around and details in light blue, ivory and brown. 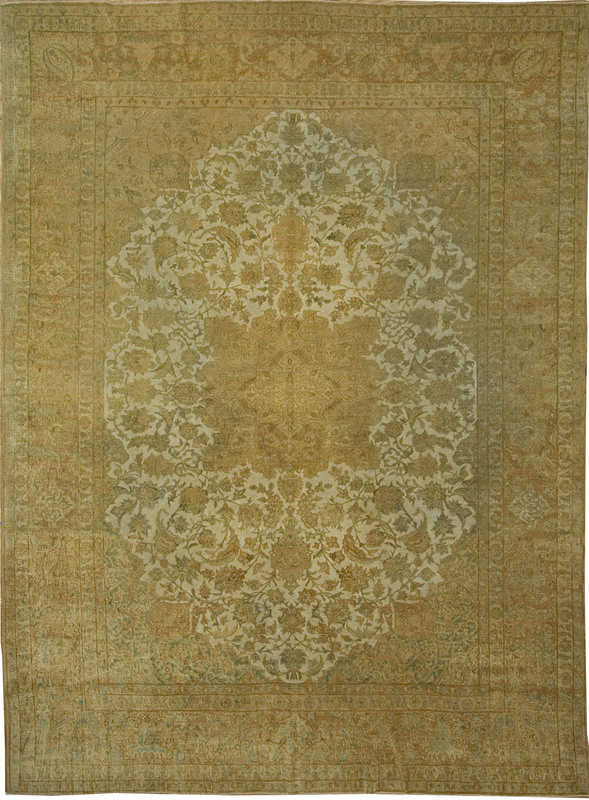 This is a fine example of those vintage rugs which carry on older traditions of soft but not washed out colors. 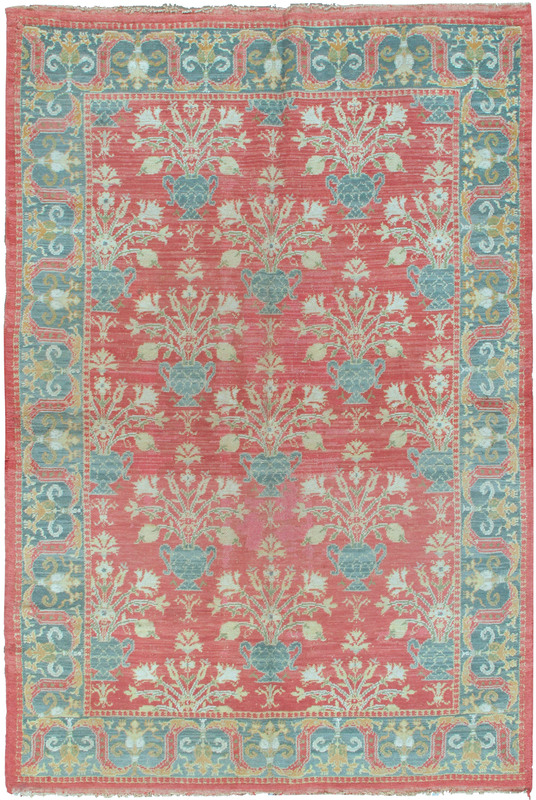 One can even bite the bullet and go all the way as with our M-973 Spanish rug with a madder red field and royal blue, ivory and yellow flowers. Could it overpower the furniture? Not really, it is too well-mannered for that. The color and pattern can complement the contrast greatly. No doubt, it is always a Great design in style, even if you haven’t seen it yet. The third contemporary setting in vintage carpets is the totally minimal palettes. The designs are there, but they are not really the main actors. Here we are seeking an ambience, a unifying effect, a feeling rather than a concrete, definable object. The Indian Agra carpet U-1125 totally abandons the concept of border or field division. The carpet holds the room together without insisting on it. The surface is quite good and there is no distress either on the rug or the viewer. One of the great things about vintage rugs is that they are not so precious that playing with them is a sin and involves no crime against carpet integrity. They add contrast to your decoration with the combination of antique craftsmanship and modern design patterns.